(Nanowerk Spotlight) Nature has excelled in designing molecular motors, something nanotechnology researchers are still having a hard time with. The potential for nano-actuators (a nanoscale device that creates automatic motion by converting various forms of energy to rotary or linear mechanical energy) is huge - basically any active system that performs some kind of work requires an energy source. Applications reach from simple pumps on lab-on-a-chip devices to move nanoliters of fluid around to nanoscale motors for nanorobotic systems. One of the challenges of designing such a motor for the nano realm is that during the design of a nano-actuator the tradeoffs among range of motion, force, speed (actuation frequency), power consumption, control accuracy, system reliability, robustness, load capacity, etc. must be taken into consideration. Most microscale systems are currently achieved by relatively large external actuators such as syringe pumps, or high voltage power supplies, which negates the advantages of the microfabricated systems. That's why scientists are quite intrigued by the opportunity to use biological organisms to construct mechanical actuators in engineered systems at the micro- or even nanoscale. An extremely powerful biological motor is the bacterial flagellar motor found in organisms such as Escherichia coli or Serratia marcescens. Bacteria draw chemical energy directly from their environment and are able to survive in a wide range of temperature and pH. 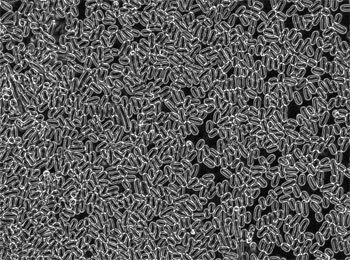 What makes bacterial propulsion system interesting for nanotechnology researchers is that bacteria are exquisitely sensitive to a wide variety of external stimuli. So far, scientists have managed to control them en masse through light (phototaxis) and chemical (chemotaxis) sensory mechanisms. In a recent example of successful use of live bacteria as mechanical actuators, scientists have built a microfluidic pump powered by self-organizing bacteria. In a previous Spotlight we have written about how researchers used bacterial flagellar motors as actuators to propel polystyrene beads ("Swimming microrobots propelled by bacteria"). Extending the use of such "bacterial carpets" to demonstrate that they can be used to generate useful work in a microfluidic system, Prof. MinJun Kim and Prof. Kenneth Breuer demonstrate that bacteria can be flow-deposited to form an active bacterial carpet, i.e. a surface array, coating the surface of an enclosed microfluidic system. "The key result of our work is that we show that the system of thousands of independent bacterial cells self-organizes, resulting in a collective motion that is capable of pumping fluid through the microchannel for several hours at speeds as high as 25 µm per second" Kim tells Nanowerk. "We also demonstrate the ability to affect the global performance of the bacterial pump by using both geometric variations and chemical stimuli introduced in the surrounding motility buffer." Kim and Breuer not only use the concept of the bacterial carpet to explore the interactions of multiple flagella, working together, and to build systems in which massive arrays of flagella work cooperatively, but also to answer basic questions regarding the effect of fluid loading on the bacterial carpets. Kim, whose group at Drexel University is experimentally investigating the mechanics of fluids at small scales including the behavior of biological materials in micro- and nanofabricated structures, and Breuer, whose lab at Brown University deals with fluid mechanics in micro- and nanoscale systems, have published a paper with their findings in the December 18, 2007 online issue of Small ("Microfluidic Pump Powered by Self-Organizing Bacteria"). "We found that flagellated bacteria can be utilized both as individual actuator and in arrays to create local flow motion for self-sustained microfluidic pumping" explains Kim. "Our paper clearly shows the practical integration of biomolecular motors for biologically-powered microfluidic system. And we also demonstrate the use of flagellated bacteria as controllable, reconfigurable elements in a microfluidic network of micro engineered systems." The two scientists conducted their experiments using a microfluidic channel fabricated from polydimethylsiloxane (PDMS) using standard soft-lithography micromolding techniques. The nominal channel dimensions used were 15 µm high by 200 µm wide by 15 mm long. Kim explains that the bacterial carpets were formed on the inner surfaces of the microfluidic channel using a novel flow-deposition procedure in which bacteria (S. marcescens) are pumped slowly into the microchannel and allowed to adhere by natural accretion. "As the bacteria flow into the channel, they collide and adhere to the PDMS and glass surfaces" he says. "We observed that the surface coverage increases monotonically with time, although unlike the smooth and densely packed carpets formed on an open slide by blotting from a swarm plate, the flow-deposited carpet asymptotes very slowly towards 85% coverage." Now comes the interesting part: after a few minutes the scientists noticed the spontaneous emergence of pumping. Following the formation of the carpet, the external flow was switched off and the inlet and outlet tubes removed from any external pressure bias. Kim notes that every care was taken to ensure that the inlet and outlet tubes were at the same level (so that there were no hydrostatic pressure gradients), that there were no bubbles, and that the menisci at the ends of the inlet and outlet tubes were identical (so that there were no capillary effects). "We observed the average streamwise velocity through the microchannel to build over the course of several minutes, reaching a peak velocity of approximately 23 µm per second at 20 min after the carpet formation" says Kim. "The overall pumping performance peaks well before the streamwise velocity fluctuations reach their maximum. After reaching a maximum, the pumping velocity decays approximately exponentially, although the anisotropy in the velocity fluctuations lags somewhat, not reaching its maximum until about 40 min after the carpet formation. The velocity fluctuations become isotropic after about 80 min although they remain higher than what would be expected for purely Brownian motion, suggesting that the bacteria still exhibit some motile activity but are unable to coordinate sufficiently to sustain any significant pumping. Several hours later, after the bacteria have de-energized, the pumping motion was no longer observed, and the diffusion velocities were found to be close to that predicted by Brownian motion." He explains that they are planning to use electric fields to dock bacteria on the substrate for the formation of the bacterial carpet, which enables to extend the lifetime of the bacterial pump. Of course, using living cells as fluidic actuator is not without challenges: the cells metabolic products might be a contamination source to the primary fluid, and the issues of motility and device longevity present substantial challenges. Also, it currently takes about 1 hour to create a densely-packed bacterial carpet using flow-deposited procedures. Kim notes that applications for such bacterially powered systems could include self-sustained fluid pumping and laminar mixing at the microscales as well as novel sensors using bacterial chemotactic sensitivity.